The people of La Línea have traditionally found work in Gibraltar, from the days in the 18th century when Gibraltar was an important naval port. This stopped with the total closure of the border by the Spanish government between 1969 and 1982 as a result of the dispute originating in 1960s Franco era between Britain and Spain regarding the sovereignty of Gibraltar. Since the border was fully reopened in 1985 a number of Gibraltarians have again moved to La Línea, where property prices and the cost of living are much lower and there is a wider range of shopping, leisure facilities and entertainment. La Línea is a major supplier of fruit and vegetables to Gibraltar; other industries include the manufacture of cork, liquor, and fish paste. It is also had an important military garrison with substantial fortifications and a port. Located on the beach promenade in Línea de la Concepción, opposite Gibraltar and only 15 minutes from Sotogrande. All 80 guestrooms at the hotel are well decorated and equipped with several modern amenities. Attentive room service is also available for your conveniences. Innovatively and elegantly designed, the restaurant serves delicious food and a fine selection of wines. The hotel's conference room is well equipped with latest technologies for you to conduct your meetings, seminars and other social events. The hotel's strategic location is ideal for those wanting to visit Cadiz, Malaga, Ceuta, Tangiers and other parts of Morocco or simply wish to play golf at any of the numerous courses in the region. Citymar Hotel Mediterráneo is a modern Costa de la Luz resort hotel, set 50 metres from the beach in the lively border town of La Línea. It overlooks the Rock of Gibraltar, five kilometres away, with fine views further towards the African coast. Guests can enjoy a drink on the hotel's terrace, and order from the room service menu. Citymar Hotel Mediterráneo offers guests two dining options: the Restaurante Mediterráneo is a bright buffet restaurant decorated in soft pastel shades, offering a variety of Spanish and international dishes. 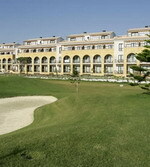 The golf courses at Valderrama and Sotogrande are 10 kilometres from the hotel. El Puerto de Santa María (English: The Port of Saint Mary, locally known as just El Puerto) is a municipality located on the banks of the Guadalete River in the province of Cádiz, Spain. According to the 2005 census, the city has a population of 82,306, of which 50,000 live in the urban center, and the remainder in the surrounding areas. The town of El Puerto de Santa Maria is 10 km north east of Cadiz across the bay of Cadiz and is best known for its ferry El Vaporcito which has been in operation for 76 years carrying passengers to and from Cadiz to El Puerto. The Hotel Dunas Puerto is a villa-style hotel set amid pine trees in the town of El Puerto de Santa Maria on the Bay of Cadiz, close to the beaches at La Puntilla and Pinares de las Dunas De San Anton. 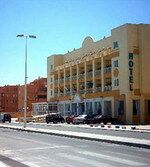 The hotel's Restaurant Las Dunas serves regional and international dishes with special menus for children. In an adjoining section, the bar has sofas and a fireplace, and offers, drinks, snacks and light meals. Guests can relax in the large outdoor swimming pool surrounded by sunbeds and parasols, while kids have their own pool. Multilingual staff on the 24-hour front desk can assist with currency exchange, laundry, babysitting and storage of valuables in the safety deposit box. There is also a reception room for conferences or parties with audiovisual facilities also available. Parking is free in the hotel's car park. 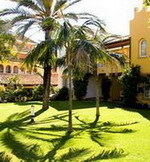 Hotel Duques de Medinaceli is one of the most beautiful Palace-Houses at the Costa de la Luz at just 2 km from the beach and situated at the heart of the old town of El Puerto de Santa María. 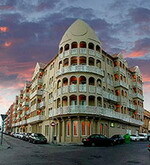 It is located in the old Mansion-Palace from the 18th century in the historic centre of the town. Enjoy the traditional atmosphere of the Duques of Medinaceli, strolling in the Botanical garden, among hundred year old walnut trees, araucarias, cactus and palm trees growing on the more than 5.000 square meters of the garden. It is good to mention its restaurant Reina Isabel which will allow you to enjoy delicious dishes at a exclusive and romantic ambience. The Hotel Los Jandalos Vistahermosa is located in El Puerto de Santa Maria, Spain, within 1.5 kilometres of the nearest beach and golf course. 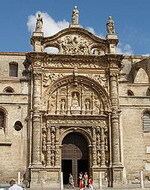 It is eight kilometres from the centre of Cadiz, and the nearest train station is four kilometres away. Situated in a residential neighbourhood and surrounded by 2,500 square metres of gardens, the four-storey Hotel Los Jandalos combines traditional Andalusian design with contemporary furnishings and bold colours. Spa amenities include indoor and outdoor swimming pools, a Turkish bath, a plunge pool and massage services. The 63 air-conditioned guestrooms and apartments are decorated in warm colours with floral fabrics. 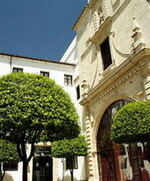 The picturesque Hotel Monasterio San Miguel is located in the port town of El Puerto de Santa Maria, Spain, by Cadiz Bay in Spain's southern Cadiz region. The hotel is 500 metres from the old church, Hotel Duquc's Botanical Gardens and the Osborne and Terry Sherry Bodegas (Wineries). The Plaza de Toros Square is 800 metres away, and the hotel is one-and-a- half kilometres from the train station. 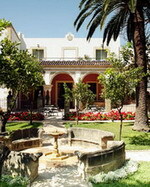 Formerly a convent of the Cappuccinos, the Hotel Monasterio San Miguel was built in 1733 and inspired by the period's 18th-century Sevillian baroque style. Front desk staff offer sightseeing tips for the region. Guests can wine and dine in the hotel's onsite restaurant and bar. Alfresco drinks are served in the poolside bar, and complimentary breakfasts are available. The hotel also has a tranquil patio area. The Barcelo Costa Ballena is a modern hotel featuring traditionally Andalusian architecture, located adjacent to a golf course and 700 metres from a beach. The hotel houses two outdoor pools, plus a children's pool, and refreshments are available at the swim-up poolside bar. The Spa Centre offers Turkish baths, a sauna, a fruit bar and a range of therapeutic beauty treatments. The Albatross Restaurant serves a range of international and local dishes in a relaxed, colonial-style setting, while the lobby snack bar offers a variety of snacks. After a day's sightseeing, guests can work up a sweat on the fitness equipment, relax over drinks in the bar, or enjoy a game of billiards. 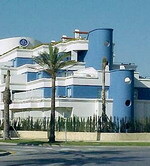 The Gran Hotel Colon Costa Ballena is a blue and white, nautically themed hotel that opened in 2001, located 400 metres from a white sand beach in central Costa Ballena, five kilometres from Rota. The midday sun can be avoided in the hotel's health club and spa, where guests will find a sauna, gym, solarium, Turkish bath and treatment rooms offering a range of massages and therapies. A hair salon, beauty spa and a large number of indoor and outdoor hot tubs complete the service. For sun worshippers there's a large terrace, equipped with loungers, surrounding the two pools (one seasonal) and the children's paddling pool. The poolside and swim-up bars serve a range of refreshing drinks and cocktails. The Hotel Duque De Nájera is located by the beach in Rota, Spain, 100 metres from the harbour and 900 metres from the town centre. 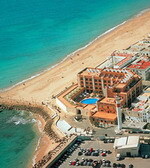 Cadiz is 45 kilometres from the hotel. Situated in the old quarter of Rota, overlooking the Bay of Cadiz, the Hotel Duque De Nájera is a terracotta-coloured Moorish stone property surrounded by gardens. The oval outdoor pool affords views over Andalusia and features a separate children's pool. The hotel also offers a fitness centre, sauna steam room and a solarium with panoramic views. The Duque De Nájera's restaurant, El Embarcadero is brightly decorated and features beamed ceilings and antique rugs. Hotel Spa Playaballena is located in the resort town of Costa Ballena, near Rota, Spain, Overlooking the Mediterranean, and 250 metres from the Costa Ballena Golf Club. This three-storey hotel complex features modern Mediterranean architecture in earth tones, and extensive gardens filled with palms. There is an outdoor swimming pool with water slides, a spa tub, and sun terrace. There is also a children's pool and an indoor pool. Restaurant el Arpon serves an international buffet in a contemporary setting with sea views. There is a baby corner with a microwave and refrigerator for baby food. 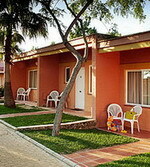 The Costa Ballena Golf Course is next door to the hotel, and miniature golf is available on site.